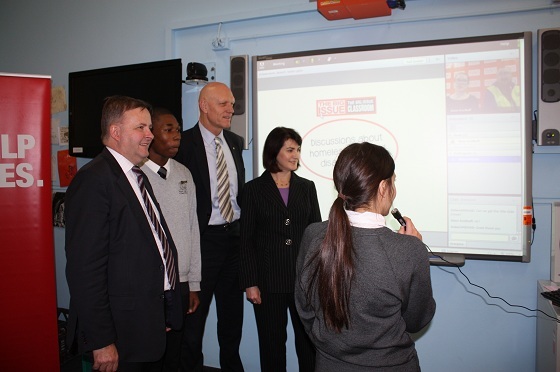 Federal Education Minister Peter Garrett joined local members Anthony Albanese and Carmel Tebbutt and Dulwich High School captains Thuba Ndibali and Ally Grasso at the launch of The Big Issue’s eClassroom. Federal Education Minister Peter Garrett today launched The Big Issue’s eClassroom initiative at Dulwich High School of Visual Arts and Design. The initiative uses web conferencing technology to help students get an insight into homelessness and poverty by talking with someone who has experienced homelessness. The project was supported by a $120,000 grant from the Federal Government. Minister Garrett was joined by Federal Member for Grayndler Anthony Albanese and NSW Member for Marrickville Carmel Tebbutt for a demonstration of the eClassroom. Mr Albanese said students at Dulwich High had previously demonstrated a strong commitment to social justice and programs such as this would give them and other schools valuable insights into the world of the homeless. “Improving awareness of this issue will help overcome stereotyped perceptions of homeless people,” said Mr Albanese.